Version 7.0 of the phone app for Nexus and Pixel devices has arrived, with... you guessed it, no major changes at all. There are some minor updates and re-workings, but this one most likely will not blow your socks off. Firstly, a 'block/report spam' option has been added to the long press dialog in the call log - in previous versions, only 'Copy number' and 'Edit number before call' were present. The inexplicable difference between the long press, bringing up this menu, and single press showing a dropdown menu, is still there, with double the amount of options, and the latter two mentioned above missing. Oh Google. There's a new icon - no prizes for guessing it's circular - used in all launchers now, rather than just the Pixel, which looks similar to the Messaging icon introduced a few weeks ago. The other change worth noting is swipe up to answer is back - it vibrates from side to side (left to right) to indicate that it needs answering (the moving green dot appears if you haven't answered a call yet with the new swipe up). As you'd expect, swiping down declines the call, and the message function is in the lower left if you can't take a call but don't want to seem rude. 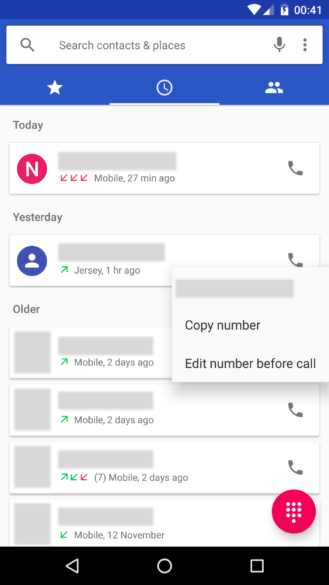 Overall, this seems much better than the previous two button design, which made it very easy to accidentally decline a call because of how close the buttons were. From the looks of things, that's the extent of the changes. It seems that the APK only installs on a Nexus or Pixel running 7.1, unfortunately - everyone else will have to wait and see if a version appears that works on other devices. This does not seem to be live on the Play Store yet, but as ever, we have it at APK Mirror. It seems that certain Accessibility services can turn the two buttons on or off. 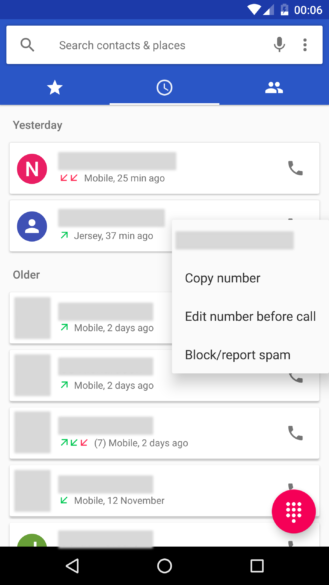 In our tests, many accessibility services - including Lastpass, Tasker, and Enpass, but there are almost certainly more - seemed to turn on the aforementioned accept/decline two button call screen in the previous 6.0 versions, but in 7.0, it only seems to be certain services, such as Switch Access, TalkBack, or anything relating to touch exploration (although, again, there may be more - we're obviously unable to test every accessibility service in every app). Thanks to Josh Brown in the comments alerting us to this.